Ursula Vaughan Williams died on October 23 2007 aged 96. She married Ralph Vaughan Williams in 1953, and contributed to several of his later works, including the magical Serenade to Music which sets words from The Merchant of Venice. 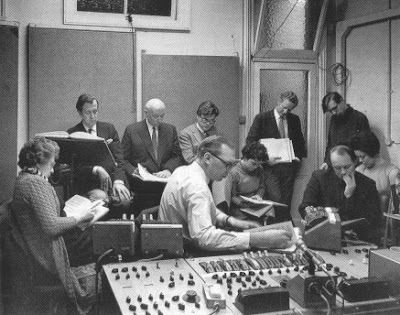 The photo above was taken at the 1971 sessions for Vaughan William's Pilgrims Progress, and shows Ursula Vaughan Williams on the extreme left. The Guardian obituary reminds us that, as well as contributing to her husband's work, Ursula Vaughan Williams provided librettos to a veritable who's who of twentieth century composers including Gerald Finzi, Alun Hoddinott, Herbert Howells, Elisabeth Lutyens, Elizabeth Maconchy, Anthony Milner, Alan Ridout, Phyllis Tate and Malcolm Williamson. So ends an important chapter in the history of modern music. Although, sadly, it may not be recognised as such everywhere. Becomes the touches of harmony. Here's a topical mix of Vaughan Williams and Norman Lebrecht. What sad news. Truly the end of an era. Thirty years ago the singer Hervey Allen told me how he and Ursula had gone through RVW's piles of music after his death. They found the 'missing' last song of the Songs of Travel together. Wow. That woke me up. It had never occurred to me that she was so much younger than RVW & could have outlived him by so many years. On the above page, the unnamed person in the picture you are displaying of the Kingsway Hall control room is the undersigned.